When it comes to tech related stuff, there’s really plenty of options for you to buy something out there. One in particular is iPmart, which is an online store that sells plenty of electronic gadgets at competitive prices. Well, I tried ordering something for them just to know how good they are, and my experience tells me that they are ‘okay’. By ‘okay’, I do mean that they are not great, but then, they are not terrible either. By far, the massive selection available over iPmart is interesting and varied with stocks almost ready available. 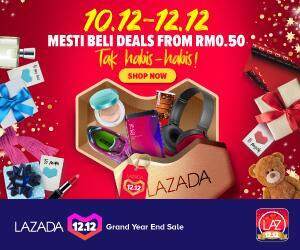 Most major gadgets such as cameras, smartphones, printers, notebooks, tablets and famous accessories are available in this online shop with major brands sold at competitive prices. Compared to rival online stores, iPmart seems to be average with promotions being made every now and then. 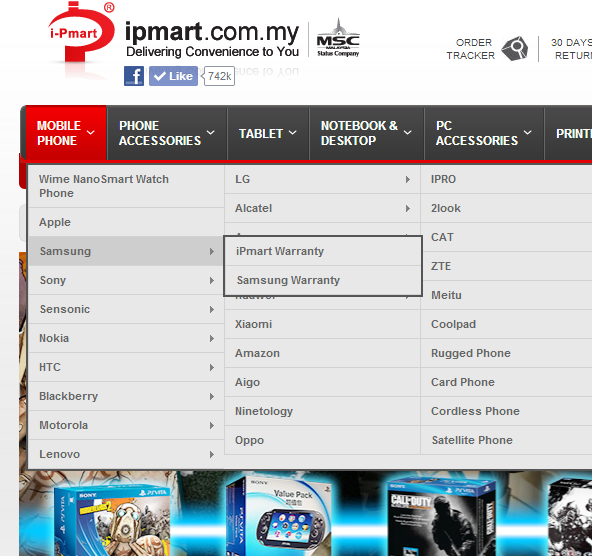 Two types of warranty provided by iPmart. The prices of electronic items over iPmart vary due to its warranty. There are two types of warranty on the offering, namely the ‘original warranty’ which is provided by the product supplier, or the ‘iPmart warranty’ which is given by iPmart themselves. The ones with the iPmart warranty cost less and there’s a good and bad of this warranty. The good side is that it is makes the product you purchase, cheaper. The downside however is that the warranty for your device can only be claimed through iPmart where as the standard manufacturer warranty enables you to claim it at any of their service centres. This can be a hassle since iPmart needs you to ship back the item. Either way, warranties are given to show the merchant or manufacturer is confident of their products, so you need not be too worried about it. On top of that, iPmart does offer a one on one exchange for good having manufacturer defects within seven days, and is willing to refund the price of the item you have received within 30 shall you are not satisfied with it. However, do note that the return of products will require it(the product) to be almost as you received it aka looking new and unused. You will not know only selected items have free delivery until you dig out for more information or click the ‘Free Delivery’ tab. 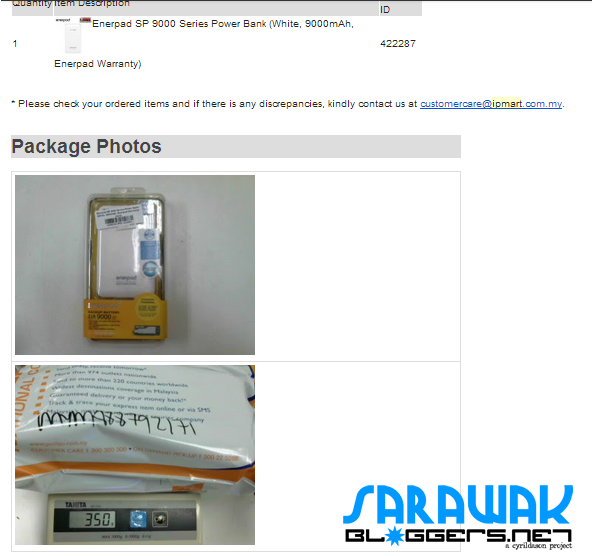 For the test of how reliable this online store is, I ordered a typical power bank, which I also needed. The poor part about iPmart is that delivery take 4-9 days, which is quite long for things they claim to have stock. If you are ordering something before the holidays, be prepared to wait longer as I did. Free delivery is provided on selected items, so be very careful before you click ‘pay’. The ‘Free delivery’ sign at the top of iPmart’s website can be a little misleading. Tracking the package is easy since they do include and update the courier service they use promptly. Two photographs of the item I ordered sent by iPmart. One thing I liked was the fact they would photograph the actual product before delivery, hence making you feel assured that the product coming is in good condition. This also allows you to recognize if your parcel has been tampered during the shipment. Here is something a lot of people tend to ignore when buying things online because most people assume it is not important until your purchase has not arrived, or if you are seeking something from the company. Well, just to know how they work, I called their hotline up (number was obtained from the booking email), and my call was instantly connected. The person behind the call was couteus and nice and helped answer my queries without being rude. Two thumbs up! To date, I have made two purchase with iPmart, with one being a smartphone (Moto G), and another being a power ban. I have to say I am satisfied with what they are offering both in terms of service and product quality. The only downside of this online shop is perhaps the length of delivery which may take quite sometime to arrive, but the rest looks good enough for you to feel safe when purchasing your tech related products. If you are intereted to try out the website yourself, go to www.ipmart.com.my. Previous articleXiaomi Mi 4 to be revealed this coming 22 July?